We have had a few family members visiting in the last couple of weeks, making the most of the school holidays . My cousin and her family live in Auckland and her eldest daughter goes to a eco-friendly primary school. Its amazing what schools are getting up to these days. They have a worm farm and garden and every Friday the whole school is completely rubbish free. Apparently this 10 year old is so in to it she tells her mum off for slipping fruit wraps or anything plastic wrapped into her lunchbox. Not surprisingly she was very keen to explore our rubbish free home. I showed her all of our rubbish systems, apart from our pit, which she wasn’t at all keen on experiencing. 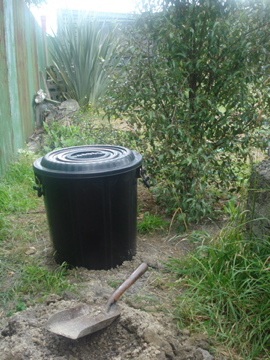 (our ‘pit’ is a long term composting system that consists of a hole in the ground covered by a big plastic bin the with the base cut out of it and a lid that seals the whole thing. It is where things like dog poo, dog fur, fish bones, hair and fingernails end up. Not a combo she was keen to see! – Although to be fair she managed a quick peek). She wrote a report for her teacher about it. We were all scared of dying in a nuclear war when I was her age, hadn’t given two thoughts about making the future a better place to be. Good on you Emma. My sister also came down with her family. The were all keen to look at our rubbish – which is still managing to fit into a shoe box. It amuses me how often people want to look through our rubbish! I’ve even taken it out with me to show interested people when we visit! It doesn’t smell because everything is washed and of course nothing is organic. When looking through everything we decided to extract two items. I took out the cigarette butts that Matty found in the woodshed and burned them in the logburner. We originally decided not to burn them because we were concerned about the toxins in the filters, but we changed our minds. I burned one and it seemed fine, so they all happily went up in a big woosh. The other item was the medication packaging from Jess the dog’s antibiotics. I thought it was a foil plastic composite, but my sister thought it was just foil (therefore able to be taken to a scrap metal dealer or recycled at the kerbside). Upon thorough scrutiny we all decided that there was no evidence of plastic and that it was indeed pure foil. Everyone who visited commented that it didn’t seem like a rubbish free house i.e it seemed to look and operate normally. I think that this is a fair observation. Most of the difference is in the way we shop, and sometimes in food preparation methods, but not so much not in what we serve up for dinner. Although my sister, who is older than me and can remember the 70’s more vividly, did mention that our pantry reminded her of mum’s ‘health food craze’. A brief period where mum somehow found the energy to raise three children, bake bread, roast bran-flake-molasses-coffee, prepare lemon and barley water and squeeze our own fresh orange juice. It definitely has gone that way a bit round here, with fresh dandelion tea, soaking beans, and growing our own ginger root. Did you know that you can make a lovely tea straight from dandelion leaves? Especially great this time of year when there are lots of supple shoots around. It’s a weak green tea like flavour. I really enjoyed your dandelion tea most delightful. I am now on the hunt for lush dandelions although I could not get over just how plentiful and wonderful the dandilions are in christchurch compared with Auckland!